My first lecture at CIETA in 1987 was about the Swiss manufacturer Fraefel & Co, St.Gallen, Switzerland. In the meantime, new facts about this firm and the vestments produced there have come to light. - most attention will be given to the documents and vestments made in the convent of Glattburg, in the eastern part of Switzerland. Arnold Fraefel (1852-1919) had been trained as a textile designer in St.Gallen and in Plauen, Germany. 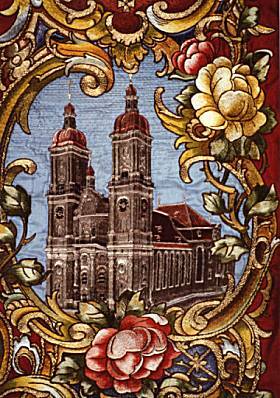 In 1883 he established his factory for vestments and also for flags and banners in the city of St.Gallen. 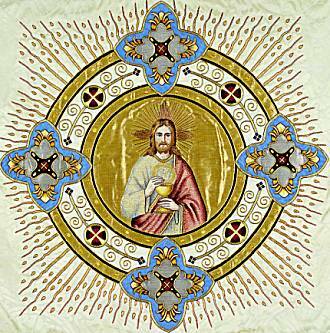 In his house he had a special workshop with a glass roof where he photographed the finished vestments. 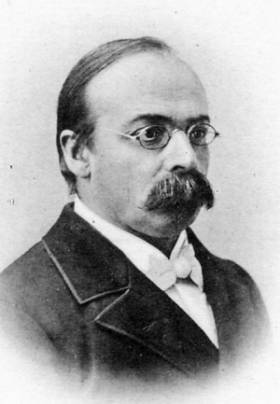 A. Fraefel-Eberle and then A. Fraefel-Halter; in 1888 it became Fraefel & Co.
Fraefel published catalogues with the help of which he offered vestments to parishes in Switzerland and in foreign countries where he established branches. A first catalogue in English appeared in 1906 and a second larger one with 48 pages came out in 1912. In the following years there were many editions of these catalogues, but without any indication of the year of publication. In the Cathedral of St.Gallen, vestments still in use today bear the label of Fraefel's factory. 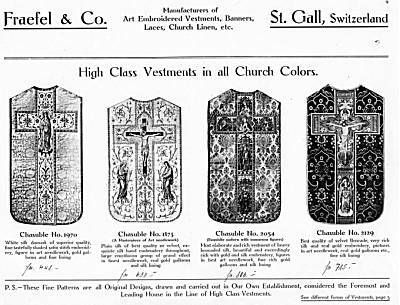 It is known that Arnold Fraefel himself designed several copes and chasubles for Augustinus Egger, bishop of St.Gallen from 1882 until 1906. Fraefel was commissioned to do this work in 1904 and supposed to deliver it in July 1906. The bishop should have received this present on the occasion of his 25th anniversary as a bishop and the 50th anniversary of his ordination. 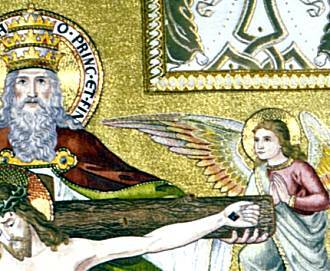 He passed away on March 18th 1906 and probably never knew anything about the vestment. The close-ups on this page show the ornamental style of the St.Gallen school, which at the end of the 19th century preferred historic Baroque and Rococo. 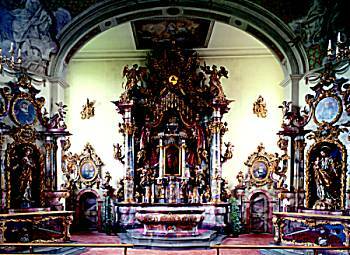 A so-called 3rd Rococo can still can be found at the beginning of the 20th century. For hand-embroidery, a silk satin fabric was stiffened with starch flour. The design was transferred to this ground. When a certain type of ornamentation had been chosen, the design had to be drawn on transparent paper, on which outlines were pierced with needles or with a special machine, and coal dust was pressed through the holes. It is known that Fraefel had branches in the USA from 1888 until 1929. An example of the production in the USA could be traced last year, when the American priest from Philadelphia  Joseph C. Rusznak  asked me about the Fraefel factory. A friend of his had shown him vestments with the Fraefel label. He wanted to know more about the factory and about the age of the embroideries. These embroideries seem to have been made with a chain stitch machine, but an examination was only possible with the photographs. A chain stitch machine was in use in Fraefel's factory. 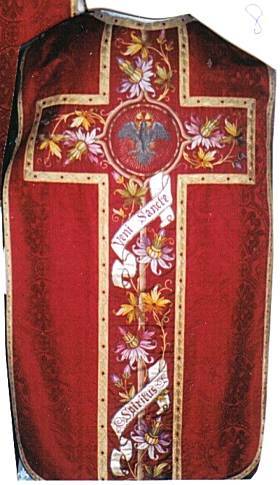 Vestments embroidered in a very similar style can be found in his catalogue of 1906. So the Philadelphia embroideries may be an example of the early years of export to the USA at the end of the 19th century. 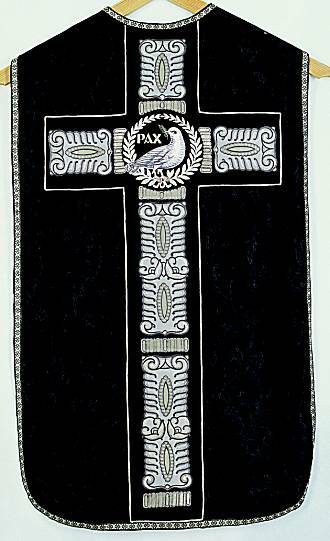 Joseph C. Rusznak found a website of an Australian seller of vestments. Besides modern examples one finds here so-called Roman and Gothic vestments. 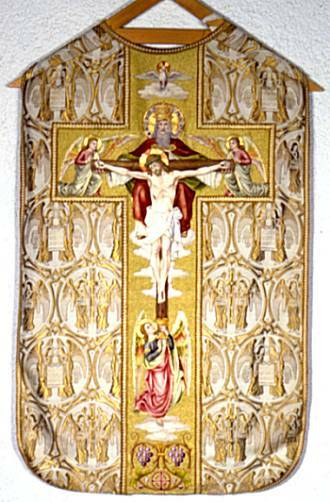 Some of them look very much like the vestments offered in Fraefel's catalogue of 1906. 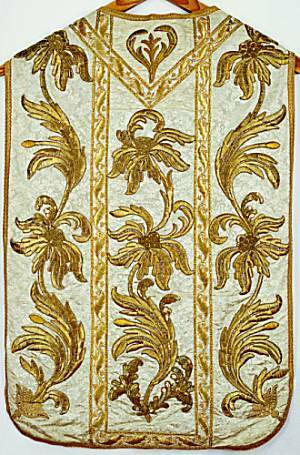 ..."incredibly beautiful antique, Roman Catholic vestments. 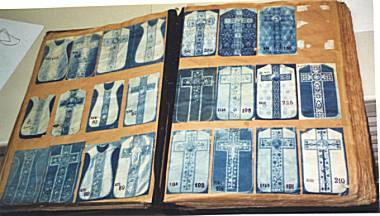 All these vestments are housed in the US, and will be forwarded to customers via my agent." So far there were only suggestions about the embroideresses. Some of them must have worked in the Fraefel factory. It was not possible, however, to find any documents about them in the factory. 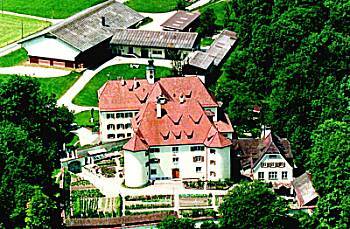 In 2002 and 2003 I had the opportunity to study documents and vestments in the Benedictine convent of Glattburg, not far from St.Gallen. Here I was lucky enough to discover designs, and together with documents, it became clear that the sisters of the convent had been commissioned by Fraefel to execute embroideries. Today there is still a chain stitch machine in the convent, which proves that chain stitch embroideries on machine were made in the convent's workshop. But let me introduce the convent of Glattburg. In 2004 the congregation had its 250th anniversary, and for this occasion research was possible and a book was published. Initially, from 1754 onwards, the sisters lived in a small and unhealthy place. In 1781, the Abbot of St.Gallen arranged a change of residence, and they now had the chance to live in rural surroundings, where they had to work as farmers, and in this way their health was restored. The most precious items are the documents preserved in the convent. Textiles are mentioned in the early chronicles written by sister Wiborada Zislin. The first one ends in 1781 and a second one dates from 1781 until 1794. Gold-embroidered chasubles are described there: it is not clear, however, whether the chasubles preserved today are identical with those named in the document. Account books from 1841 until 1867 prove that the sisters were commissioned to execute embroidered vestments for a great number of parishes in their neighbourhood. In 1856 there is an interesting entry referring to two altar cloths with rich lace and to an alb. These pieces were sold to a certain priest named Bisseger in Ermatingen TG, who had ordered them for the Emperor Napoleon III. 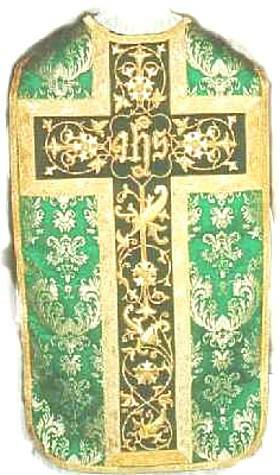 The black chasuble presented here is still preserved in Glattburg. An almost identical piece was found in Bischofszell (eastern Switzerland). The account books in Glattburg mention several orders for vestments for Bischofszell in 1847. Some more account books were kept from 1885 until 1950. There is a first entry for the Fraefel factory on January 20th 1886, concerning Sfr. 390. From that year until 1929 a steady increase of commissions for the St.Gallen vestment factory can be found. Once a year, in late December or early January, up to several hundreds of Swiss francs were paid to the convent. Some letters from Arnold Fraefel to the convent are preserved as well. They confirm that Fraefel was very pleased with the sisters' hand-embroidery. In the years of World War I, Fraefel seems to have lost his connections with a convent in Belgium and he therefore started to employ the sisters in Glattburg. At present, it is not known whether he commissioned other Swiss convents as well. 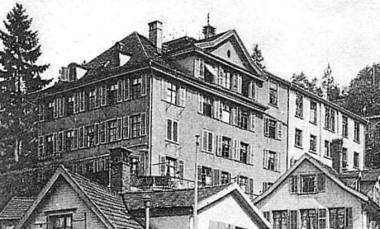 Although there were commissions for the St.Gallen factory, the sisters still received direct orders from the neighbourhood. 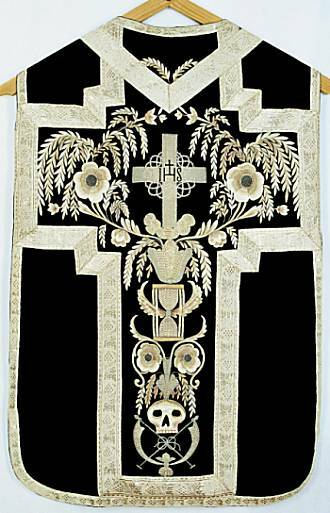 The same was true for another vestment which was made for the church of Andwil. 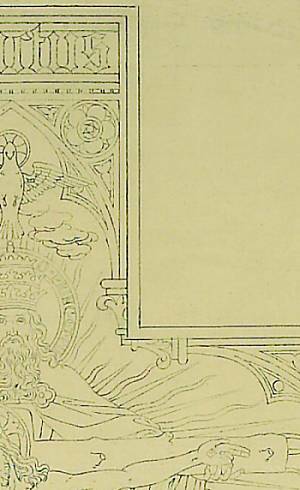 The account book points to an embroidered vestment for Andwil, November 11th 1915 and the sum of Sfr. 1213 which was paid for it. Transparent rolls with embroidery designs are still preserved in the wooden cupboard in the convent's workshop. Some of them are marked with numbers which correspond to the ones in the catalogues. There are also inscriptions like: "all rights reserved for Fraefel & Co", or "for Andwil" or "for Oberbüren". 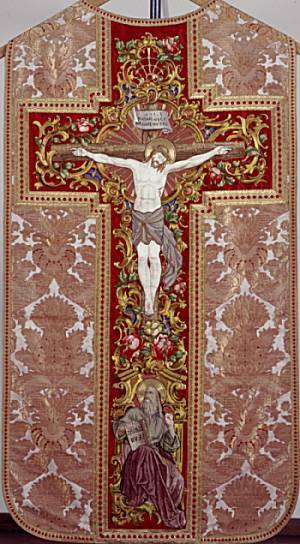 In Fraefel's catalogue the Andwil and the Oberbüren chasubles are offered as one and the same item, and in both examples Christ on the cross held by God the Father is shown on the back. 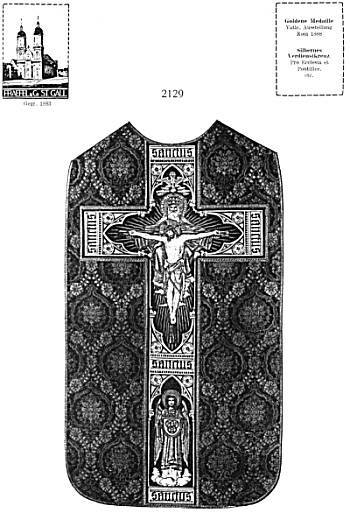 But whereas the Andwil example looks exactly like the pattern offered, there are some alterations on the Oberbüren chasuble. On the front, Saint Ulrich, the saint of the parish of Oberbüren, is represented, and on the back, additional angels can be found instead of the inscription. Comparisons between the finished embroidery, the design and the catalogue give us an idea of the working process. First the subject was determined, probably with the help of the catalogues. In a second step, the design had to be made in the appropriate size and with the required alterations. Most probably this was done in the Fraefel factory by professional designers and then delivered to the embroideresses in the convent. There the outlines were copied onto the fabric. Sometimes the patterns preserved today show blank spots. This points to the fact that the patterns could be used several times, and different additions were possible. Among others there was Marie Thoma, later Sister Benedicta (1880-1946), who played an important role at the beginning of the 20th century. She was born in Uznach, not far from St.Gallen. 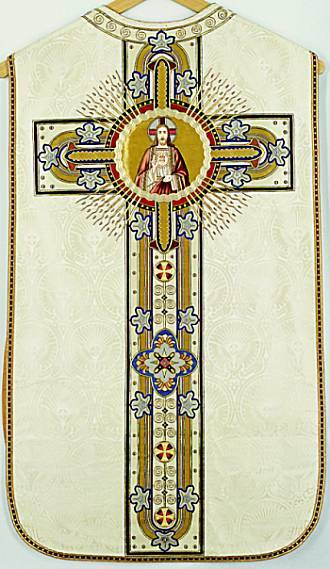 After her years at elementary school, she learnt to embroider vestments in Fraefel's factory in the late 1890s. 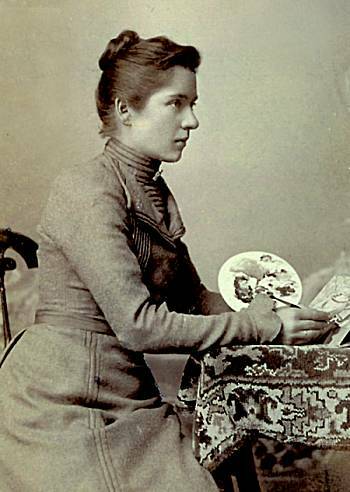 In 1902 she entered the convent in Glattburg, and very soon became head of the workshop. Some of the older sisters still remember Sister Benedicta embroidering the white vestment of around 1920, which is preserved in the convent today. At the same time, in the early 20th century, the sisters also used machine-made elements which they applied on silk fabric. 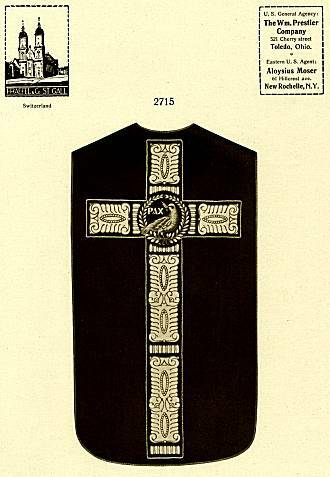 In Fraefel's catalogue (the publication date of which is not known), a black chasuble, no. 2715, is offered. Here single elements were worked on the embroidery hand machine and then applied on a black fabric. Such an example is still preserved in the convent. Here the ground fabric is a special one - it used to be the wedding gown of the mother of one of the sisters. 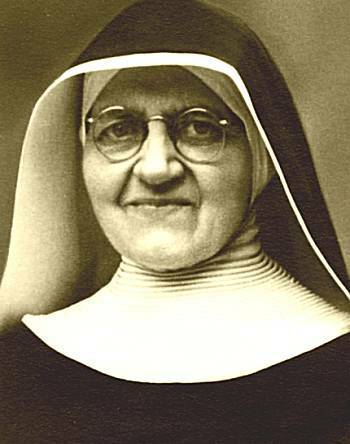 Sr. Hildegard (formerly Irma Nef) was born in 1909 and died in 1996; she had many brothers and was one of the youngest of the children. Her father had an embroidery factory. She donated her mothers wedding gown (wedding around 1898) when she entered the convent in 1934). 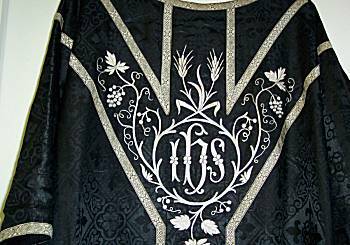 When we compare the examples of embroidered vestments, a change in the embroidery style over the years becomes obvious. Whereas in the vestments of Bishop Augustinus Egger the historic Rococo style was preferred, the embroideries of Sister Benedicta and her workshop show new influences. 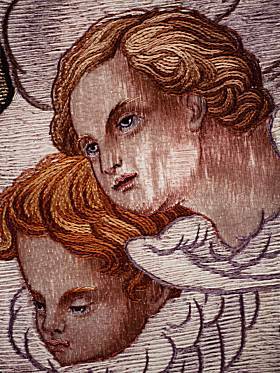 At this time art nouveau and also the religious Beuron style influenced religious designers and embroideresses.